Our UTV Guide is here to help you sort through all the choices in this exploding category. There isn't even any agreement on what to call this variety of all terrain vehicle. Yamaha goes with side by side - Kawasaki says RUV, and now Honda comes out with MUV. What they do have in common is four wheels and side x side seating. They may be called UTVs, Side by Sides, RUV or MUVs, but they all mean fun! We'll show you what choices you have, what they do best, the parts and accessories available for them, and anything else we can think of that might be interesting to you. If you have any suggestions - drop us a note through our Contact form. So let's get started! Latest news and rumors for all brands and models. Includes new accessories and innovations. Side by Side Accessories - Tons of accessories on the market. But which ones really do the job and where do you get them at the best price? Those are the questions this accessories guide will answer for you. Cab Best Buys - Need more protection than a windshield? You need a cab enclosure and we'll tell you all about them and where to find the best deals. Snow Plow Guide - You're thinking about a snow plow but you need some more info? What works and where do you find a great deal. That's exactly what we'll cover here. Windshields Guide - You've been looking at UTV windshields and now you're confused with all the choices - full, half, tilting, folding, vented, flexible, lexan, polycarbonate -what does it all mean? We explain. Arctic Cat Wildcat - Arctic Cat shocks the world with a new sport side by side! New models are being introduced at a furious pace in the hottest UTV segment - the sport UTV class. Learn all about this radical new model from Arctic Cat. 2019 Can-Am Commander - Quick Guide to features, prices, and specs for all models. 2019 Can-Am Maverick Sport - Guide covers all Maverick Sport, Sport Max, and Trail models. Features, prices, and specs. Can-Am Maverick Sport Max DPS - New for 2019 sport utility four seat side by side. Description of all the features complete with lots of photos and other info. Can-Am Defender Max Xmr - Polaris gets some competition in the six seat utility mudder category. Get the scoop in one place here. Can-Am Maverick Sport Xmr - This one's for the mudders. Details with photos, videos, info and specs. Can-Am Maverick Sport Xrc - New for 2019 Sport Xrc aimed at rock crawling fans. Find out about all the unique features included in this special package. Can-Am X3 Turbo - Easy to use guide to all X3 Turbo and Turbo R models with specs, prices, and features. Can-Am Maverick X3 Max - 2019 Guide to the X3 Max Turbo side by side models. 2019 Can-Am Defender - Features, prices, specs and more for all Defender models. 2019 Can-Am Defender Max - Every Defender Max model covered with prices, specs, and features. Can Am Commander - Can-Am joins the side by side class with several new models. Get up to speed with our complete guide. Videos, photos, specs, and more about this much anticipated new Side by Side line up. Honda Pioneer 1000 and 1000-5 - 2019 model review with details of features for all models. Honda Side by Side Guide - Quick Guide to all Pioneer 500, 700, 1000, and Big Red models. Updated for 2019. Honda Pioneer 500 - Full review of the 2018 Pioneer 500 models. Honda Pioneer - Honda gets more serious with it's new 2014 UTV models, the Pioneer 700 and 700-4. A bed that converts into rear seating for two provides the most versatility in a side by side that we've seen so far. Honda Big Red MUV - Exclusive Review with video, photos, and more of the new Honda Big Red MUV. If you're looking for automotive style quality and reliability in a side by side, the Big Red may be for you. Kawasaki Mule Pro MX - Full, detailed review of this new for 2019 Kawasaki Mule. Kawasaki Teryx Model Guide - The Kawasaki Teryx model line up for 2013 has some interesting additions. We'll tell you what they are, along with the major differences between each model. 2009 Kawasaki Teryx - 2009 Kawasaki Teryx Video, Specs, pictures, and more. There were major updates to the Teryx for 2009. Learn details on the new features like digital fuel injection and adjustable suspension. Kawasaki Teryx Accessories. 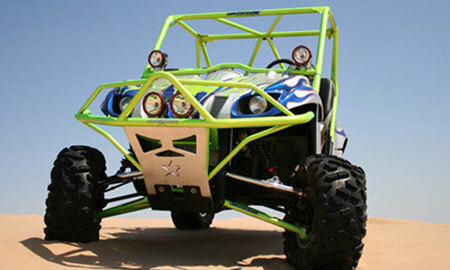 - Looking to perk up performance and looks with Kawasaki Teryx accessories? Or maybe just add some cup holders for convenience? We'll show you what's out there from $6,000 suspension kits to $4 hitch pins. Kawasaki Teryx 4 Models for 2013 - Detailed review and driving impressions of the 4 seat Teryx 4 models. Lots of photos, videos, and specs of all the models. 2019 Mahindra Roxor - Full review of the 2019 Roxor covering updates and new accessories now available. Polaris Side by Side - Exclusive reports on all the Ranger and RZR models. Polaris Rangers - Reviews, specs, pictures and more of every Ranger model. Polaris Ranger RZR. The one that started the performance trend. Polaris Razor - Learn about all the latest Polaris Razor models. The RZR line now includes UTVs for kids, 50 inch trails, wide open spaces and more speed, Razors that seat 4 adults, and a top of the line RZR 900 for all out speed. Polaris RZR S - High Performance Polaris Razor S. Full review of the Razor S with all the features and specs of the newest RZR model. Bonus video and photos. Polaris RZR XP 900 - The top of the line performance side by side for Polaris. The XP 900 sets new standards for speed and handling with 88 horsepower and 14 inches of wheel travel. Learn more in our full review of this hot rod! Yamaha Wolverine X2 - 2019 guide and review of the latest Yamaha Side by Side UTV. Yamaha Rhino - Guide to the original side by side. Learn about all the latest Rhino models. Yamaha keeps expanding the Rhino line with new models and lots of options for existing models. Keep up with all the latest with our exclusive Rhino Guide. Yamaha Viking - Full review of the new for 2014 Viking. Details of all the features and specs with lots of photos. Find out if it's really better than the Rhino.